On Sunday, March 17, 2019, our Lord and Savior called his daughter, Georgia Mae Evans, home to eternal rest after a brief illness at Heritage Hall Nursing Home, Blackstone, Virginia. Georgia Mae was born on June 14, 1939 in Dinwiddie County, Virginia to the late Kate Elizabeth and George Jones. 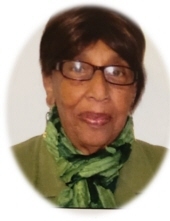 She was educated in the Dinwiddie County School System and graduated from Southside High School in 1958. She loved her high school years and still enjoyed attending Class Reunions. She accepted Christ at an early age and joined Poplar Lawn Baptist Church. She regularly attended Worship Service, Sunday School, Sunday School Union, Special Church Programs, Bible Study and any engagement where the pastor preached at visiting churches. She was a strong advocate of her church. During her earlier years, she was employed at Levi Strauss, Blackstone, Virginia and later had several employers as a housekeeper. She enjoyed working for each employer and socialized most of the time. During her spare time on Saturday Nights, she was a faithful, volunteer cook at the Country Inn Restaurant. She worked there for over 20 years and enjoyed talking and joking with everyone she came in contact with. She was well known in Dinwiddie and Blackstone. There was never anyone that she was not able to “joke” with. Georgia Mae favorite pastime was visiting people in their homes, hanging out at McDonalds, Walmart and Pit stop. Georgia Mae married the love of her life in August 1962, Wesley L. Evans of Ford, Virginia. They were married and inseparable for 55 years until his death on December 6, 2017. She was preceded in death by three sisters: Geraldine Greenhill, Ethel Jordan and Dollie Claiborne; one brother, Orphan Claiborne. She leaves a legacy to cherish her fondest memories and jovial personality her nieces and nephews whom she considered her children: three nieces; Bettie Perry (Benjamin), Patricia Greenhill, Bettie Backus (William); eight nephews; James Greenhill, Leon Claiborne (Judy), Harvey Greenhill (Loretta), Arthur Greenhill (Katrina), Kelvin Jordan (Varie), Gregory Jordan (Laurie), George Evans, III; ten great nieces; Tandrea Jones (Vaughan), Angel Perry, Chasten Davis, Benita Cary (Kenny), Patrice Greenhill, Candace Shands, Samira Willis (Chris), Chelsea Harmon, and Kara Emejuru (Ike); seven great nephews; Chaz Davis, Derrick Chavis, Danielle Greenhill, Danny Greenhill , Maurice Claiborne, Randy Claiborne and Graham Terrell (Sara); a step son, Tyrone Hill; a sister in law, Goldie Evans and numerous relatives and friends. Funeral Services Saturday, March 23, 2019 at 11:00 a.m. at Poplar Lawn Baptist Church, Blackstone. Interment church cemetery. To plant a tree in memory of Georgia Mae Evans, please visit our Tribute Store. "Email Address" would like to share the life celebration of Georgia Mae Evans. Click on the "link" to go to share a favorite memory or leave a condolence message for the family.